We are excited about the next major project in Elma - Elma Community Complex. (See diagram below for artist's rendering of the project). Elma Public Library—The new location will provide additional space, large room for programming, all areas will be handicap accessible, and it will be in close proximity to day care, bus stop and park. The multi-purpose room with kitchen will serve the needs of library programs, city council meetings, location for family gatherings, meetings, etc. and an indoor play space for day care. Capacity is approx. 50 people. Regional Health Services of Howard County Clinic will provide family care services to include physicals, acute visits, lab services, and well child checks. Exploring options for on-site medication availability. The Elma Early Childhood Center will be able to serve more infants with the addition and more efficiently serve the needs of children in 3 year old preschool. Estimated cost of the project is $1.5 million. The CDBG grant is due April 19, 2019. We need to have matching money committed by April 8, 2019. If we are not able to raise the funds needed and/or we do not get the CDBG grant, all donations will be returned. All size donations are welcome and appreciated. Platinum - $50,000 - Eligible for naming rights on buildings. Diamond - $25,000 - Eligible for naming rights on rooms/areas. Gold - $10,000 - Eligible to sponsor a mural window covering on brick school building that will be removed and incorporated into Complex. Silver - $5,000 - Eligible to have name on a patio paver incorporated into sidewalks at building entrances. 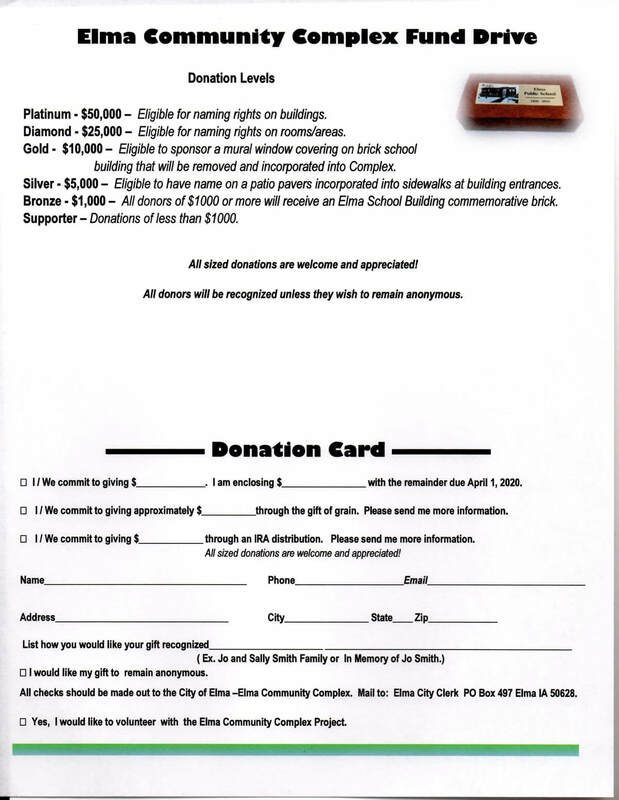 Bronze - $1,000 - All donors of $1000 or more will receive an Elma School Building commemorative brick. Supporter - Donations of less than $1000. Below is a link to a brochure and donation form. The Elma Elementary School closed in 2015 and the school property was given to the City of Elma at that time. The non-profit day care continues to operate in the new portion of the building and one of the classrooms in the former school building under a lease with the City. The City Clerk's office has been moved into the old portion of the school building. The City has explored potential uses for the property. Keeping the day care and providing them with more space for the infant room was of utmost importance. Could the old section of the school be re-purposed at an acceptable cost was a critical factor also. The Elma community was approached by Regional Health Services of Howard County wanting to explore locating a medical clinic in town. The Elma Public Library was wanting more space. The City formed a school building committee to look into the possibilities and report back to them. A study of several options was performed by an architect and mechanical engineer. After extensive research and discussion, the committee presented 3 options to the City and community. Two seemed to stick. One option included keeping the old section of the school and the other option did not. Finally the decision was made not to use the old portion of the school. There were two main reasons. First, when renovating an old building it is difficult to get a cost estimate because you never know what you might run into. Secondly, there is no guarantee on the on-going efficiency of a renovated 2-story school building. The City Council directed the committee run with the option that puts an addition onto the day care, renovates the gymnasium into a library, multi-purpose room and City Clerk's office, and build a new medical clinic building south of the gym. The old section of the school would be demolished. Having all of these services in one location will benefit everyone. The Howard-Winn bus and a private Riceville bus stop at the day care. Usage of the library will increase because of the proximity to the day care and bus-stop. Children need medical services. The day care needs more space for infants and the 3 year old pre-school program. The multi-purpose room with a kitchen will be used by the day care, library and community. CHECK BACK OFTEN FOR UPDATED INFORMATION AS THE PROJECT PROGRESSES! 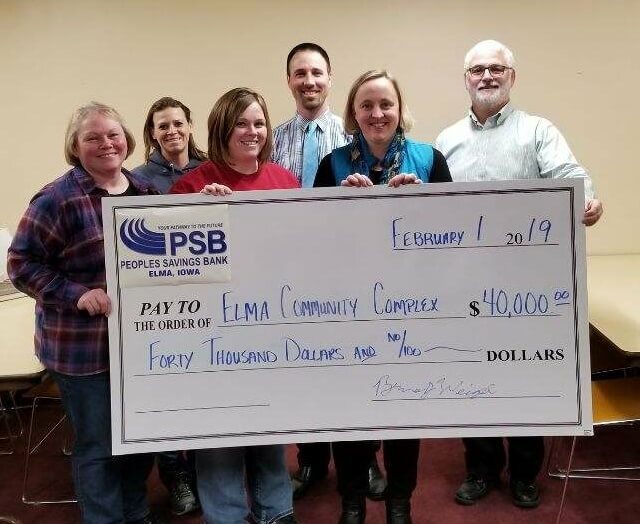 Picture caption: Peoples Savings Bank recently committed $40,000 towards the Elma Community Complex. Pictured are committee members Renee Burke, Elma Public Library Director; Shannon Gebel, Elma City Clerk; Kayla Kraft, Elma Early Childhood Center Director; Kyle Teeling, Vice President at Regional Health Services of Howard County; Erin Ludwig, committee member and Bruce Weigel, President of Peoples Savings Bank. Fundraising for the Elma Community Complex has begun! The Elma Community Complex involves putting four nonprofit entities on the same campus, which was the former Elma school and is now owned by the City of Elma. Plans are to renovate the current gymnasium into a public library, city Clerk's office and multi-purpose room with a full kitchen. An addition to the Elma Early Childhood Center is also being planned for an infant room. The current infant room will be repurposed into a classroom for three year old preschool. Regional Health Services of Howard County will furnish and operate the clinic building being built on the same campus, south of the gymnasium. Estimated cost of the project is $1.5 million. Proposed funding sources include Community Development Block Grant (CDBG) and other grants and contributions from other individuals and businesses. Fundraising recently began. The CDBG grant is for $600,000 and is due April 19th and matching money needs to be committed. "We currently have $170,000 committed to the project," shared Bruce Weigel, committee member and President of Peoples Savings Bank. "This is a big project for us and we have a long ways to go. Over the years we have accomplished several big projects by working with others such as the bike trail, Memorial Hall renovations, Wellness Center, and building of the daycare. We are hopeful to have $600,000 committed by early April when we can apply for the CDBG Grant, but we need to have matching money committed." Several fundraisers are being done to benefit the cause including a Fish Fry on March 22 at the Elma Memorial Hall. There will be an Ice Cream Social on June 9th. Plans are also underway for an All School Reunion during the Old Roundhouse Trail Days July 12, 13, 14th, 2019. 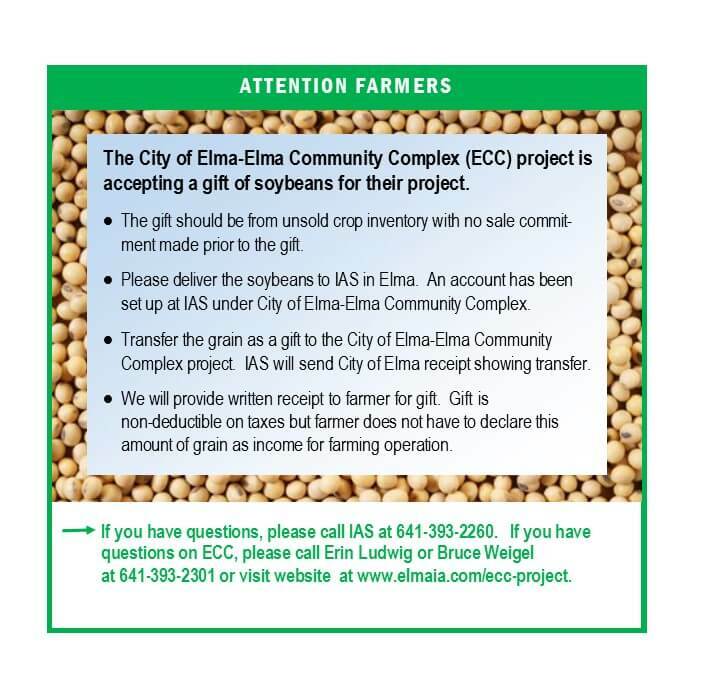 The City of Elma is currently accepting donations and pledges towards the project. All sized donations are appreciated. 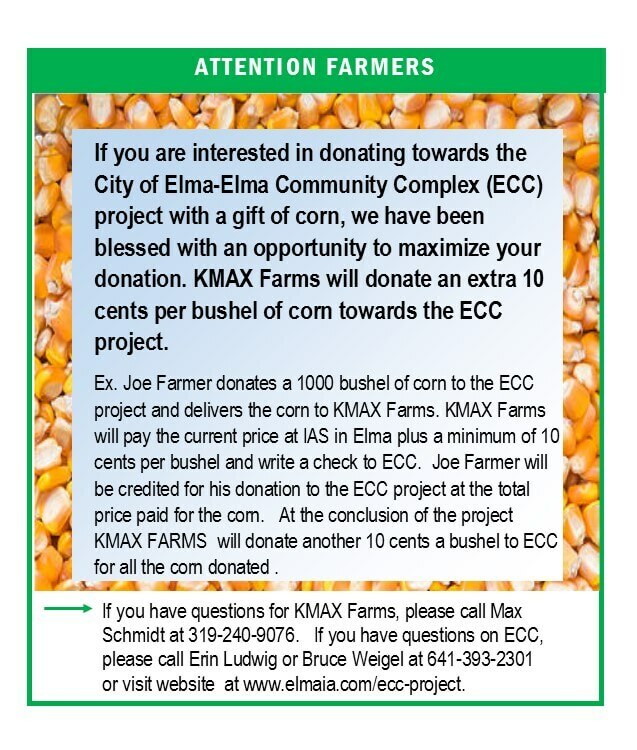 For more information contact any of the committee members: Shannon Gebel, Renee Burke, Kayla Kraft, Kyle Teeling, Erin Ludwig, and Bruce Weigel; go to www.elmaia.com/ecc-project; or call the City Clerk at 641-393-2543. An "All you Can Eat" Fish Fry is scheduled for Friday, March 22nd in Elma from 5-7:30pm at the Elma Memorial Hall. It is a fundraiser for the Elma Community Complex project. The Elma Community Complex involves putting four nonprofit entities on the same campus, which was the former Elma school and is now owned by the City of Elma. Plans are to renovate the current gymnasium into a public library, city Clerk's office and multi-purpose room with a full kitchen. An addition to the Elma Early Childhood Center is also being planned for an infant room. The current infant room will be repurposed into a classroom for three year old preschool. Regional Health Services of Howard County will furnish and operate the clinic building being built on the same campus, south of the gymnasium. 4/5/2019 News Release-We are very appreciative of these veteran's service as well as their recent donation to the ECC Project. Thank you American Legion John Frahm Post 597 for your $1000 donation! Elma Notecards and Magnets Available For Sale! The ECC Fundraising Committee is selling a variety of Elma Magnets. They are $2 Each. They are also selling blank note cards featuring various pictures of historic Elma on the outside. 5 different cards and envelopes in each bundle for $5. Note Cards and magnets are available at Peoples Savings Bank and Elma City Clerk's office. They can also be mailed out by contacting the Elma City Clerk at 641-393-2543. $414,387 has been committed to the project thus far! The committee began fundraising in February of 2019 for the 1.5 million dollar project and is applying for a variety of grants. Donations of all sizes are appreciated and can be mailed to the City of Elma PO Box 497, Elma IA 50628.